Novaly is a sweet and outgoing 13 month old who loves being outside and cuddling stuffed animals. Although she likes all things girly, especially tutus, she is also a car lover and a big football fan. She loves pink, bright colors, Sesame Street and going to the beach. Just a few days into 2018, while taking pictures, Novaly’s mom noticed a mirror-like reflection in Nova’s right eye instead of the normal red eye seen in flash photographs and because she knew the signs, knew something was wrong. Novaly’s parents felt like their world stopped as they received devastating news on January 16 when they took her to the doctor. Their fears were confirmed. Their precious little girl was diagnosed with Retinoblastoma, cancer of the eye. 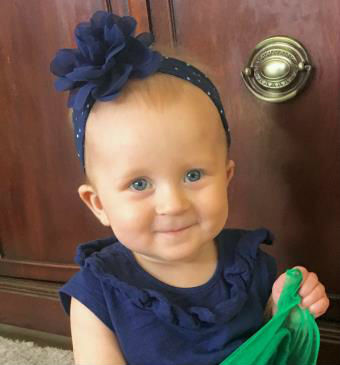 At just five months old, it seemed unbearable for her parents to comprehend but they knew they would do whatever they needed to save their little girl and her beautiful blue eye. Tests quickly revealed a large tumor was growing on the back of her right retina. Her optic nerve was not obstructed, leaving hope for peripheral vision as well as being able to keep her eye, since the cancer had not spread beyond the retina. This was good news as they caught it early and it is curable at this stage. After a lot of information and multiple options for treatment, her parents chose what they felt was best both long and short term. Nova’s systemic chemotherapy treatment began immediately after placing a port in her chest. She started with a two day course every four weeks for 6 months causing mouth sores, blisters, nausea, vomiting, troubles sleeping and the expected hair loss. However, along with laser treatment, the tumor began shrinking immediately and they were hopeful. During her monthly eye exam and laser treatment, post her last chemo, the news wasn’t as good. The tumor started growing. Devastated again, Nova’s parents needed a new treatment plan. Hope came in the form of a new treatment called intra-arterial chemotherapy. However, this form of treatment hadn’t been executed for retinoblastoma at OHSU yet. Her parents decided quickly, that was about to change. Nova was going to be the first, a trailblazer. Her parents were confident, her doctors were ready and their girl was too. Within hours the new treatment plan was set in motion. With her new treatment there are less overall side effects. During each of these new chemo treatments, she must be sedated and lay flat for four hours then spend the night in the hospital for observation. Combined with laser treatments, the doctors’ goal is to shrink the tumor by breaking down the cells directly. After Nova’s first round her tumor has shrunk to half the size and doctors are hopeful. She still appears to have peripheral vision in her right eye and the left is healthy. In spite of all of this, Princess Nova is thriving in life and her bubbly personality draws people toward her both young and old. Her laugh and smile instantly lights up ​a room. Novaly will be adopted as a Sparrow to Corbett Schools. Students will work hard to not only love and support her, but raise money for Nova through sponsored community service and fundraising.